This recipe is actually a modification from one we found in the Curves Fitness & Weight Management Plan book on page 68. The original recipe calls for shrimp, we were out of that so I had some crawfish tails on hand as a perfect substitute and it turned out to be a wonderful dish. And it is a very quick and easy preparation, taking all of about 30 minutes from prep time to sitting at the dinner table. 1. Add olive oil to a large non-stick pan and brown the sliced turkey sausage on all sides. Remove and drain on paper towels. 2. Add the onions and bell pepper and sauté until soft, then add the garlic and continue a few more minutes. 3. Add the chicken stock and saffron threads and bring to a simmer. 4. Add the rice and stir well then cover and simmer on medium-low heat for 20 minutes or until rice is tender and all liquid is absorbed. 5. 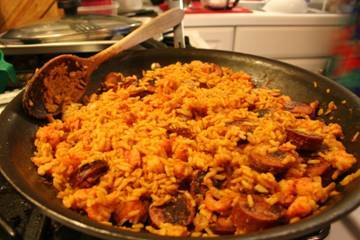 Add the crawfish tail meat (or shrimp) and continue to cook until crawfish tails are heated through or shrimp are pink. Fold in the turkey sausage. ohhh that looks delicious, I love the addition of crawfish! Absolutely love this…plan to try it out this weekend! Thanks for sharing! Wow, that is an easy preparation. Great for a weeknight meal! I have saffron sitting in my cupboard right now that’s begging to be used. I use to bartend at a country club and the Chef there made a dish like this. I LOVED IT! He also made bbq crawfish…It was addicting. looks very, very good ! Now that crawfish season is over we are relegated to frozen tail meat for the next few months. Oh my this looks awesome and I still have a pound of frozen crawfish tails left! !